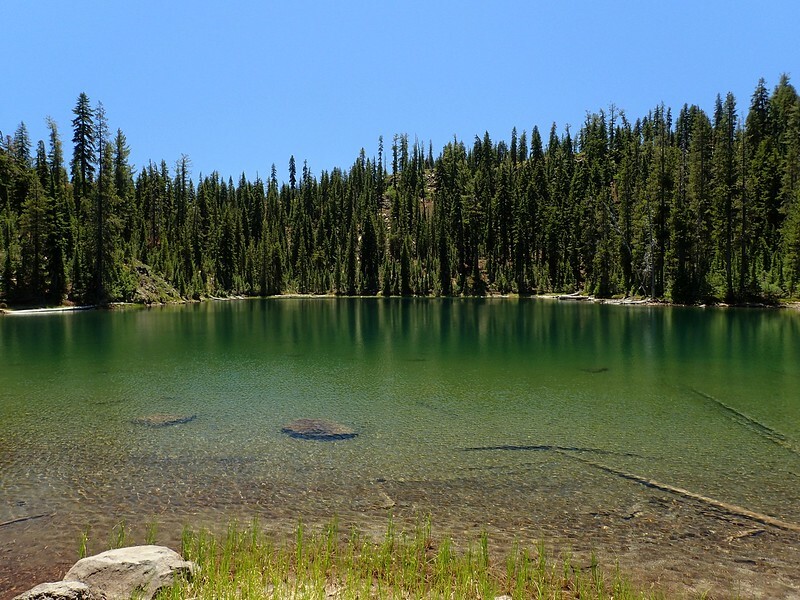 We do occassional hiking and backpacking trips with our California friends Wayne and Diane and this year we decided to spend some time with them in Lassen Volcanic National Park – seemingly one of America’s lesser appreciated national parks. 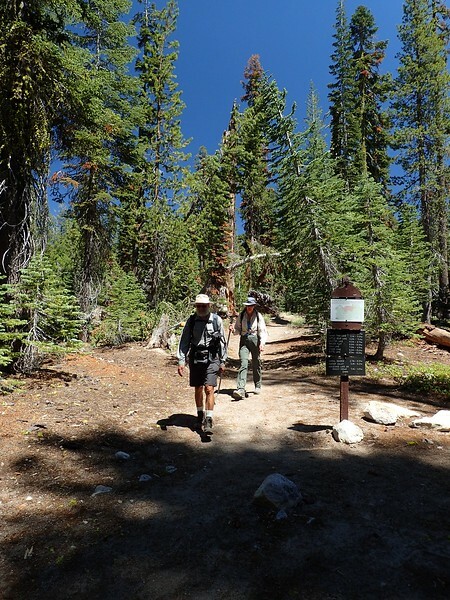 Our previous trips had focused on climbing Lassen Peak but this time we also made an effort to see a bit more of the park, in addition to climbing the peak. 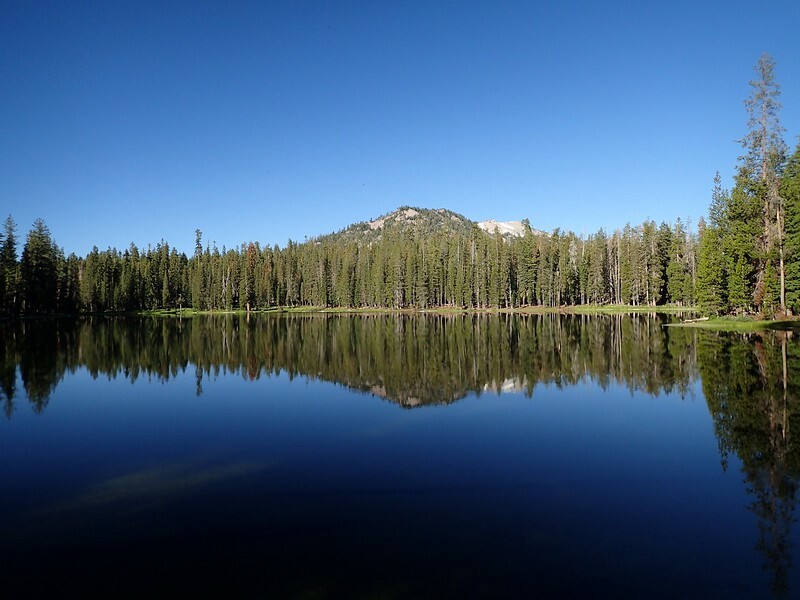 Today we set out for the Summit Lakes Loop, starting from Summit Lake on Highway 89. 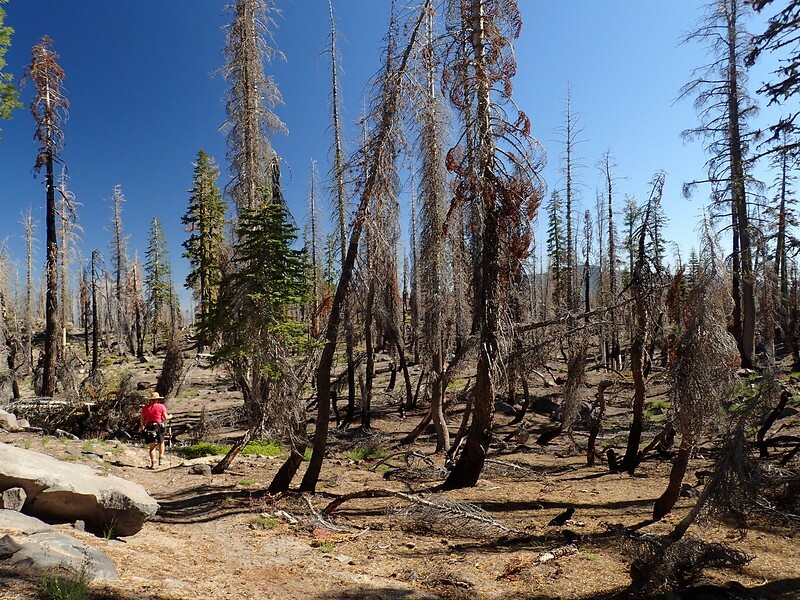 This is also called the Cluster Lakes Loop and appears as such in Lautner’s (2010) Day & Section Hikes~Pacific Crest Trail~Northern California hiking guide (Hike #23). 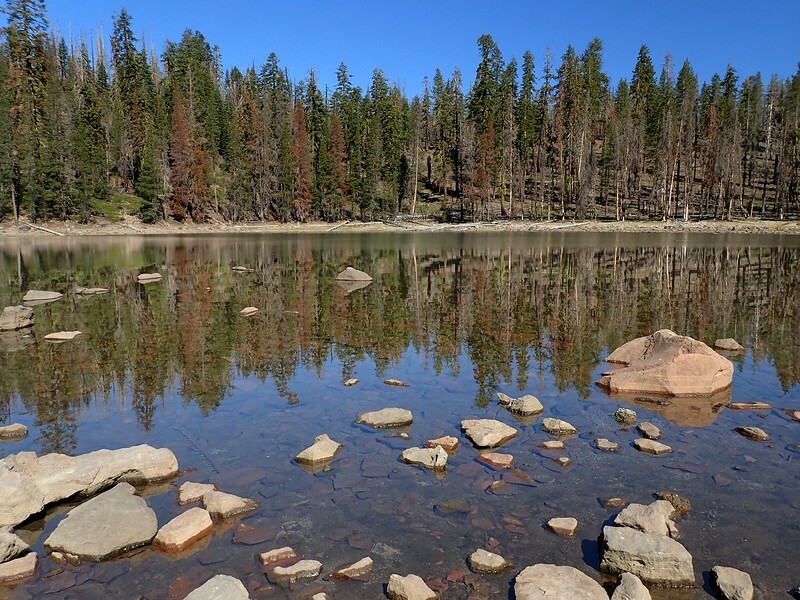 We picked this loop because it promised – and delivered – a tour of the most concentrated collection of lakes in the Park, starting with Summit Lake, which is right at the trailhead. 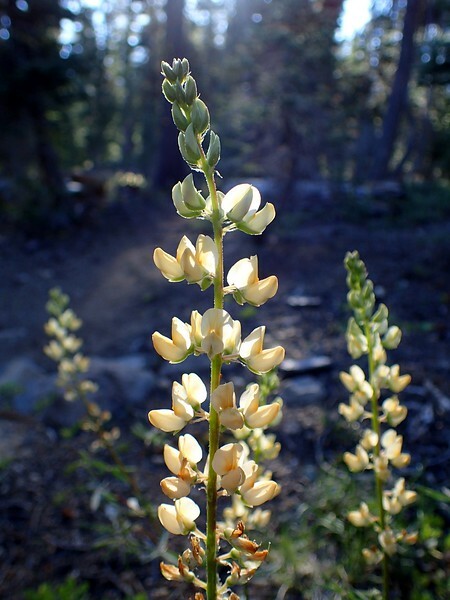 Despite this low snow, drought year (sadly one of many), there were still quite a few flowers blooming along the trail. 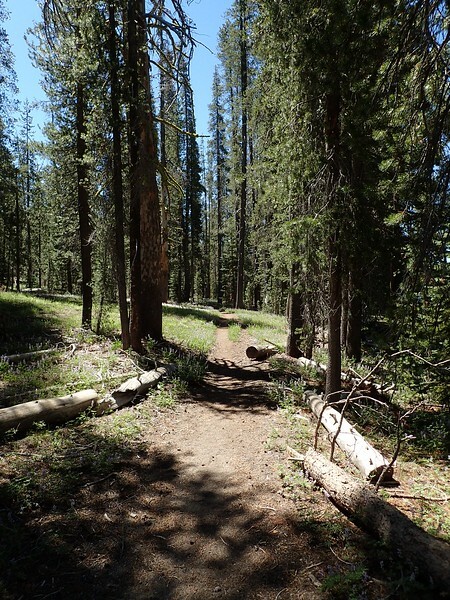 and then turned north on the trail toward the Bear Lakes. 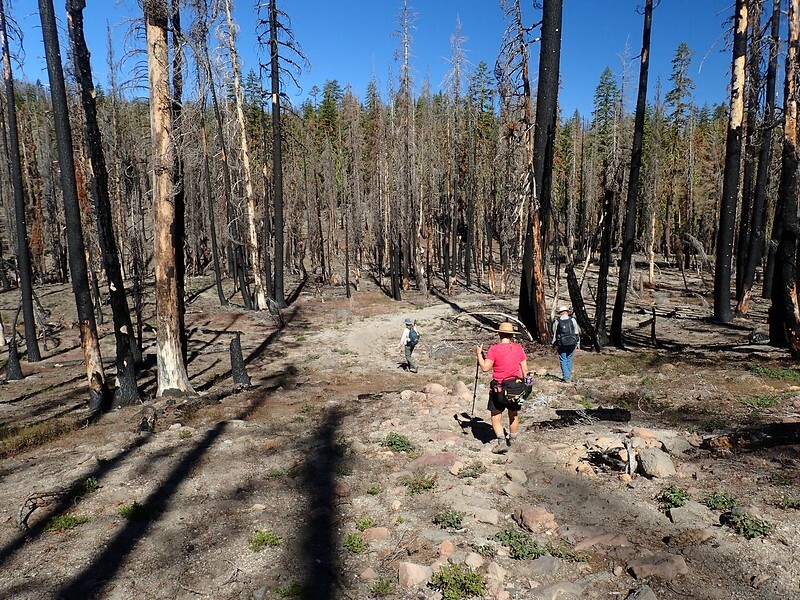 Unfortunately, about half way to the lakes, the trail leaves the forest and enters the devastation wrought in 2012 by the massive Reading Fire. 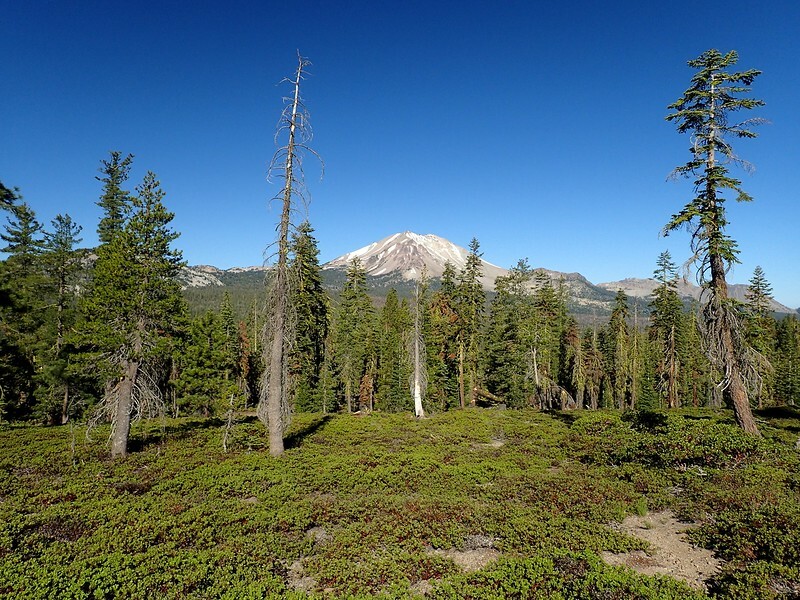 I was once again struck by what I’d missed by not taking time on earlier visits to go hiking rather than just focus on the peak. 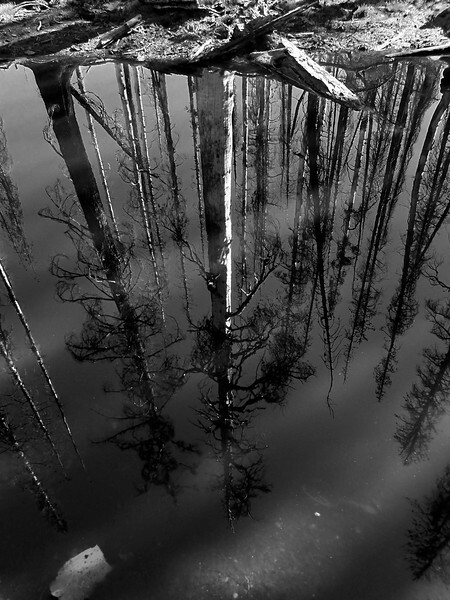 Double sigh. 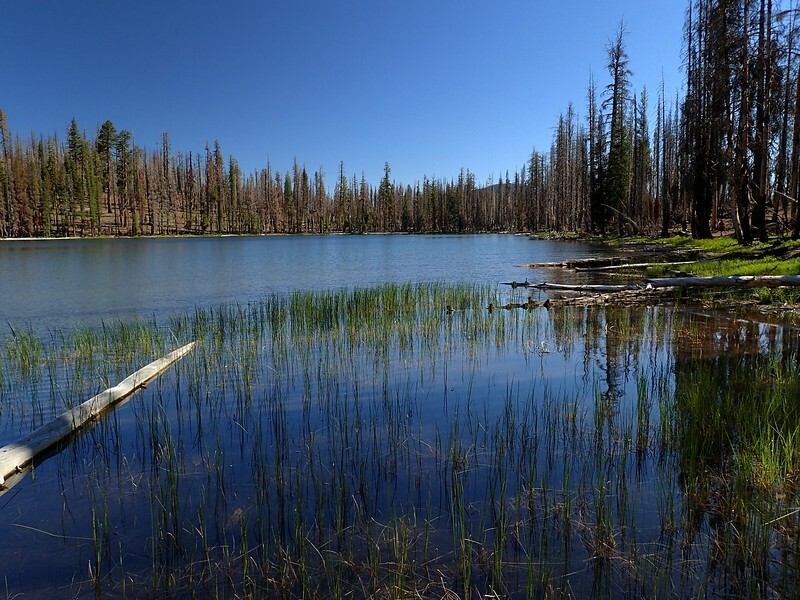 Big Bear Lake, which looked comparatively lush if you looked the right way. 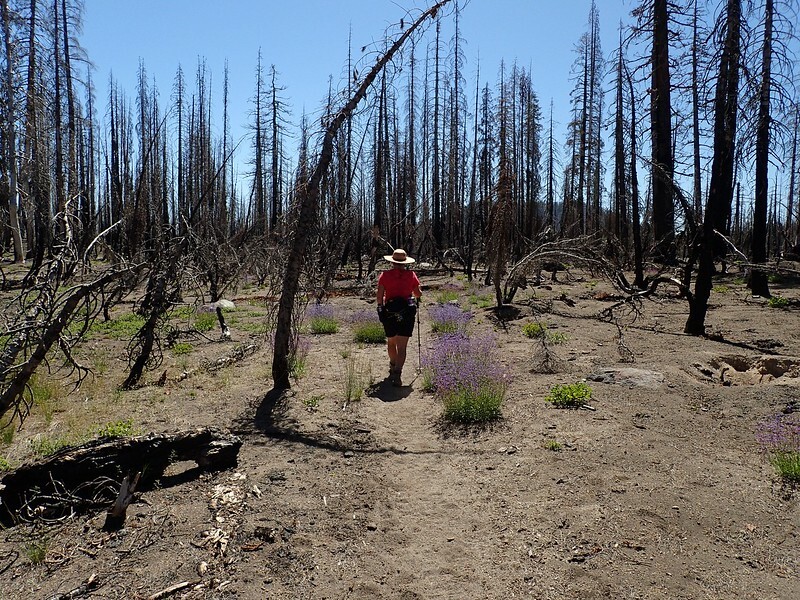 to a junction with the Pacific Crest Trail (PCT) back in the unburned forest, whose shade was very welcome. 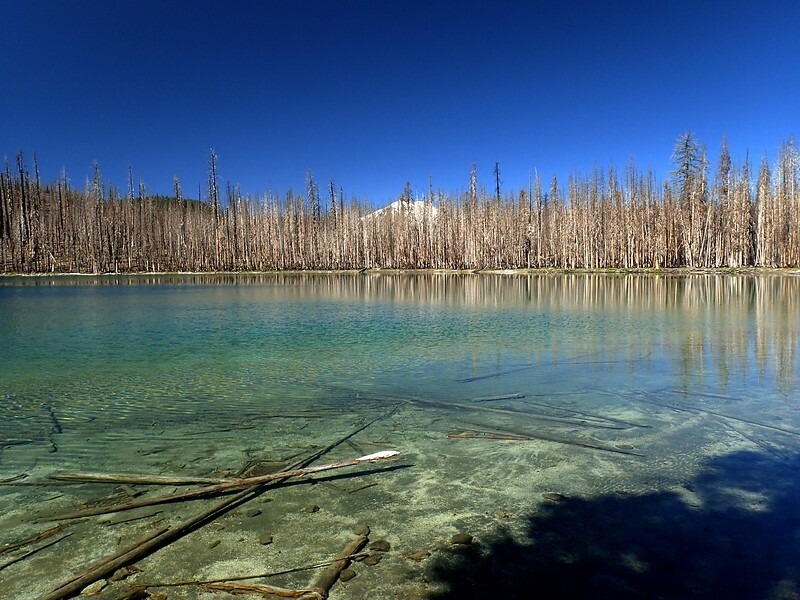 A short ways down the PCT, we came to a lunch spot on the shores of Lower Twin Lake, where Wayne and Diane, as is their custom, cavorted nakedly in the lake’s cold, refreshing waters. 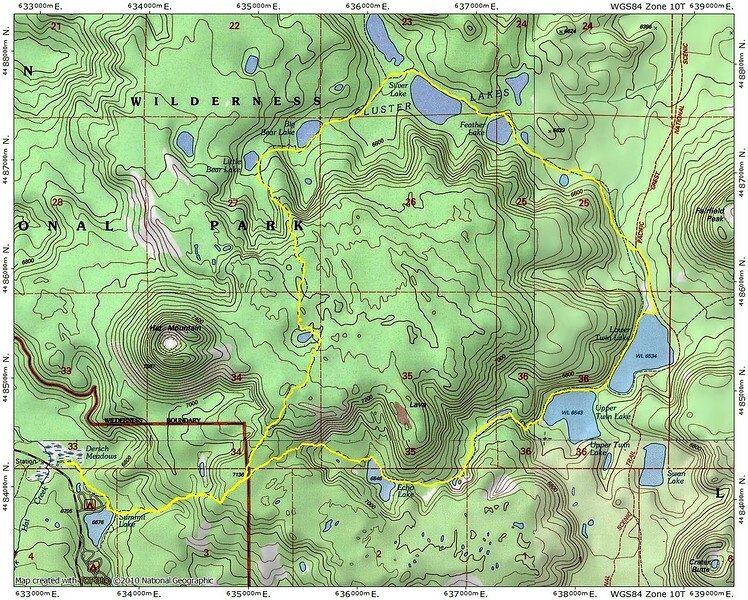 to complete the loop with a return to Summit Lake. 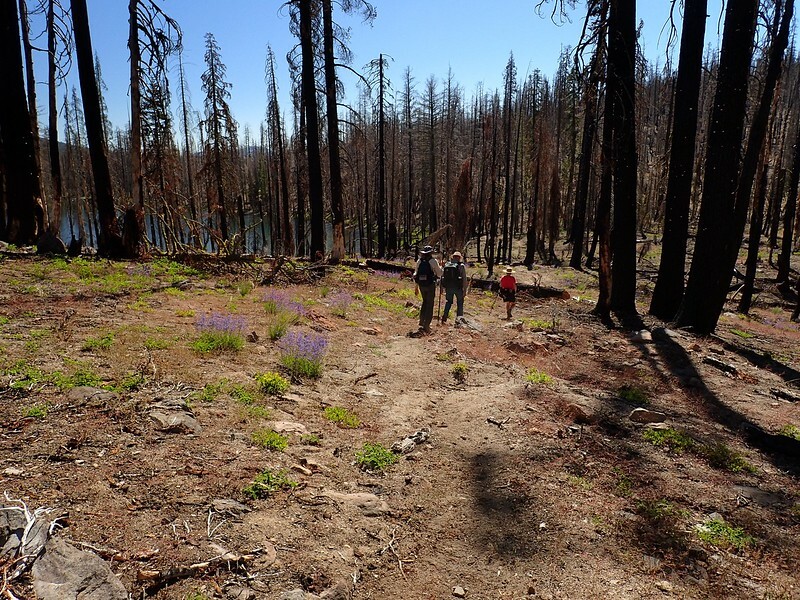 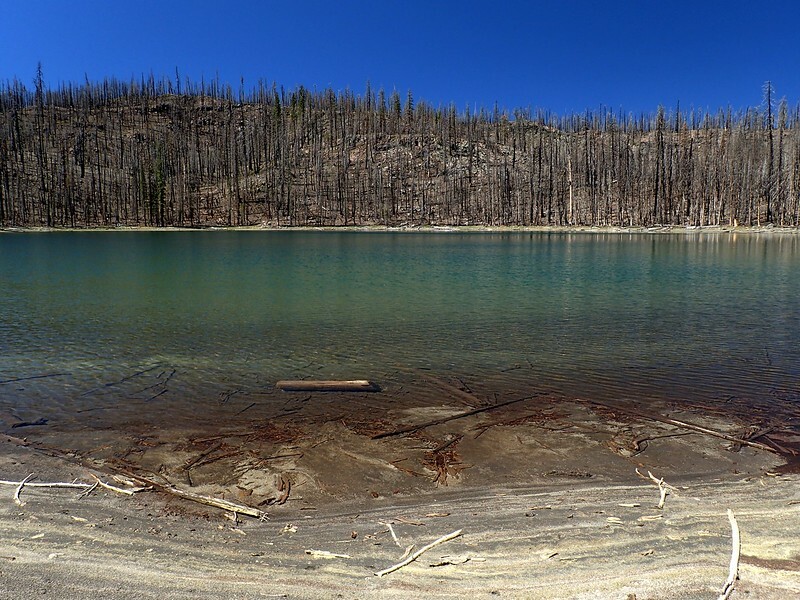 Despite the burned forest, this was a great hike past some of the nicest lakes in the park (12 miles roundtrip; 1,200 feet of elevation gain). 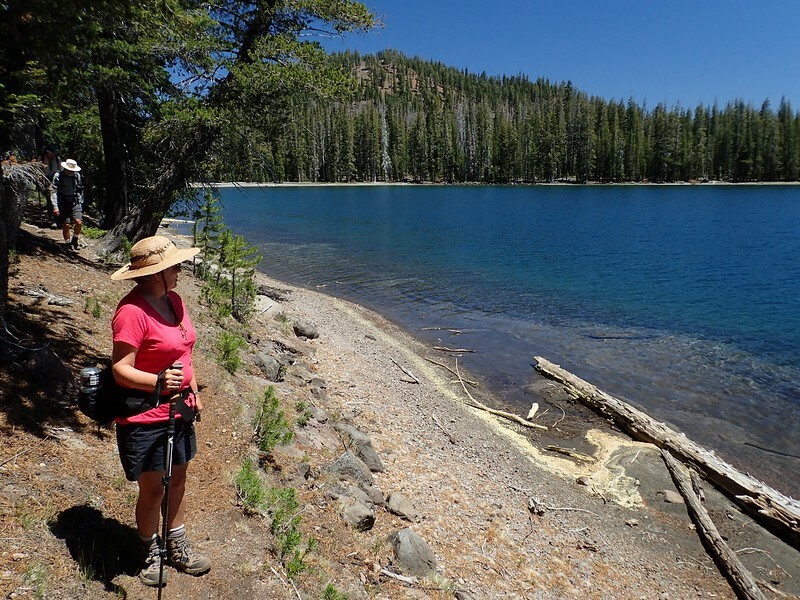 Unlike the “crowds” we encounterd hiking up Lassen, we saw only about a dozen people all day – none on the north part of the loop and most between the Summit Lake Trailhead and Lower Twin Lake.